With your own machine you can make all kinds of wonderful sundaes - join the Google+ Sundae Community today! Owning your own machine means you can have delicious homemade ice cream in as little as 20 minutes. Ice cream makers come different types, shapes and sizes. Some require for the mixing bowl to be frozen in advance (up to 24 hours required in my experience) - hence why some people keep their bowl permanently in the freezer, only taking it out when they're ready to batch. Then there's the electric machine - with a built in freezer it usually comes with full instructions and recipes. This photo shows a typical example of an electric ice cream maker. See photos of my own ice cream maker. Watch me making ice cream at home in my videos here. What a thought.... delicious ice cream in just 20-40 minutes! You can create exciting, colorful variations, textures and flavors when you have your own ice cream maker. Impress the kids as well as your friends at parties and summer barbecues. A machine to take pride of place in your kitchen. 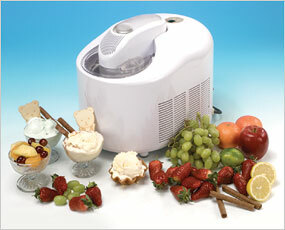 Read about the a advantages of an ice cream maker here on my dedicated page. This photograph is of a chocolate and banana ice cream sundae (right) which I made at home. I've made a lot of ice cream at home over the years so have thousands of photographs like this. View some more of my sundae pictures on the sundae gallery as well - I hope you take inspiration from them to make your own. Great fun and so tasty! 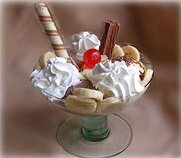 If you are not sure which recipes to try first, read about the top 10 ice cream recipes on this website. Some flavors you will recognise but there might be a few that you didn't imagine would be so popular.